The most frustrating thing that happens while driving is when you experience a flat tyre, this problem was, to some extent, taken care of with the help of tubeless tyres. It was a great revolution then, making long journeys much safer but still it required inspection for punctures over time. The world needed something else, something that could make driving hassle free. This dire need urged tyre manufacturers to come up with the idea of airless tyres and the best of them is ‘Air Free Concept Tyre’ from Bridgestone. What really amazing about this kind of tyres is, that they are made of springy plastic and resin construction which enables them to put an end to the punctures, live long and absorb shocks better than any other conventional tyres. It also has been learned that this kind of airless tyre constructions has undergone some experiments to store and recycle the kinetic energy from the car. Like any other product, this kind of tyres also come with a downside and that is, they are do get wear out pretty soon as they are unable to generate all those side forces the conventional tyres do. The first attempt was made by Michelin back in the Nineties when they combined wheel and tyre together and called it “Tweel”. That wasn’t a big success then, but still it ploughed the way for future attempts by others too. 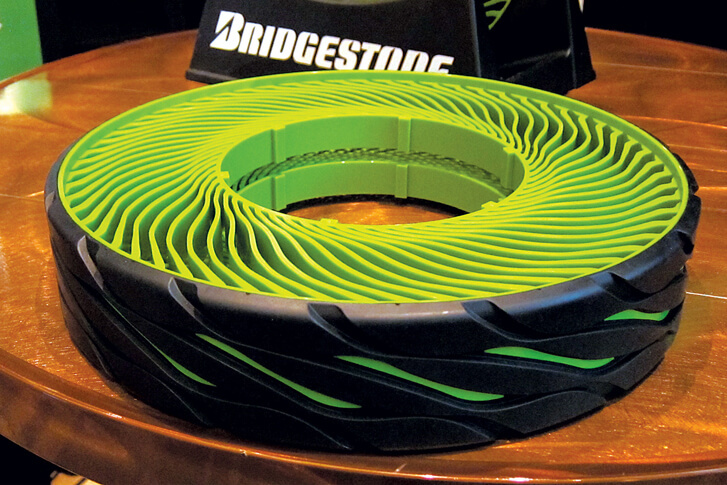 In 2011, Bridgestone introduced its first generation of airless tyres which back then, had somewhat interesting construction. It had rolling resistance greater than conventional tyres, 220lb was the maximum load bearing weight limit, and it had the maximum speed of 3.7 mile per hour. Latest version of this tyre made public in this year’s Tokyo motor show where they demonstrated the maximum speed of 37 mph and a maximum load bearing weight of almost 904lb, which is to be honest, a whole lot more useful.